Manufacturer of a wide range of products which include electric wire rope hoist, wire rope hoists, double girder electric wire rope hoist, mhc single girder electric wire rope hoist, explosion proof electric wire rope hoist and electric chain hoist. 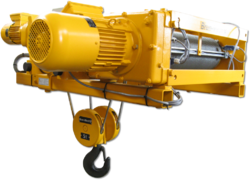 New compact-design MHC Electric Wire Rope Hoist offer outstanding quality and efficiency. Absolutely reliability is one of the most important features. MH CRANES introduced latest technology like infinitely variable speed control, braking energy feedback system, safety monitor into control system. All those innovations benefit our customers for greater reliability and efficiency and make MHC wire rope hoist very competitive in the market. Hoist motor, gearbox and drum form a compact and sturdy package and offers efficient use of floor space under the crane and increased lifting heights. Outstanding design features include the parallel configuration of rope drum and hoist motor, modular design and the functional arrangement of all components. Joints with direct fits between components such as hoist motor, gears, rope drum and limit switches save parts and improve reliability. Enclosed hoist housing protects the rope drum; rope guide and limit switch equipment from dirt and climatic conditions. Machinery design is based on FEM calculations for standard lifting gear allowing safe and reliable lifting of loads from 3.2 to 80 tons. Machinery has smooth and silent operation that extends the lifetime of the hoist. 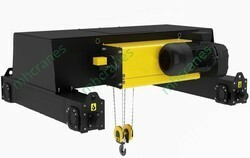 We are offering Wire Rope Hoists with power trolley from 1 to 5 ton capacity. These are designed to work for medium duty rugged and repetitive performance, the Hoist frames are made from Heavy Duty steel plates & sections. The gears are machine cut & hardened. The wire drum is made from seamless pipe with specially designed rope guide. It guides the rope for proper seating over the grooves and is designed to prevent overlapping. Unlike most manufactures who use a standard motor and a separate brake, our Hoists have a conical rotor motor with built-in conical brakes which are very reliable and extremely efficient. The Rotor of Conical rotor motors, by virtue of their construction and design features, move axially when started. A conical disc with brake lining on it, mounted on one end of the rotor shaft is braked against a similar conical surface of hoist body. This is done with the help of Helical spring mounted in the spring housing, which is placed on the other end of rotor shaft. The conical disc gets released when the motor is started, due to the axial movement of rotor. If the motor is switched off or in case of power failure, the spring operated rotor moves back automatically and applies the brake. The braking torque is 100% above the motor torque at rated load. Thus the brake is actuated by the motor itself without any need of external brake, making the braking very reliable and fail safe. All hoists are provided with over Hoisting and over Lowering limit switches. Having low head room the hoists give move lift for the same space. The hoist is supplied complete with control panel, motors, contactors, transformer etc. and is controlled from 24V pendant push button control suspended from hoist. With its expertise on leading technologies, MH CRANES developed modular concepted MHC series Wire Rope Electric Hoist which has been certified with multiple patents. It adopts the trendy C-type design, rendering compact structure, smooth running, and precise positioning. Adopted various new technologies including inverter control braking energy recovery and safety monitory system. MHC Wire Rope Electric Hoist provides you with better logistics solution, assured reliability and safety for operation. The lifting capacity of MH CRANES’ MHC series Wire Rope Electrical Hoist ranges from 1t to 100t. Depending on its structural layout, it can be grouped as fixed type, single girder suspension and double girder travelling types. By its applications, it can be categorized as general usage, dedicated clean room usage, explosion-proof, and the nuclear plant use. MHC Electric Hoists features compact and simple structures of module design with plenty of modular combinations. It deemed to be your ideal solutions for light, medium or heavy duty transportations and will surely satisfy your requirements under various working conditions. 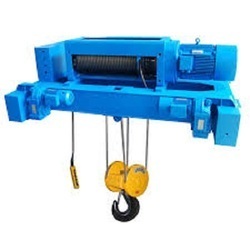 We are amongst the most reputed names in the industry, offering MHC Single Girder Electric Wire Rope Hoist. Shell--Made of die-cast aluminum alloy, light but hard. Motor--Adopt the Side Magnetic Series YEP Braking Motor. Gear--Made of alloy steel by carburizing quenching treatment. Thus transmission with low noise and high efficiency is guaranteed. Side Magnetic Braking Device--Allows instant brake as soon as the electric power is cut off. Chain bag--Light, attractive and durable. Hook--Hot forging with perfect strength that is hard to break.